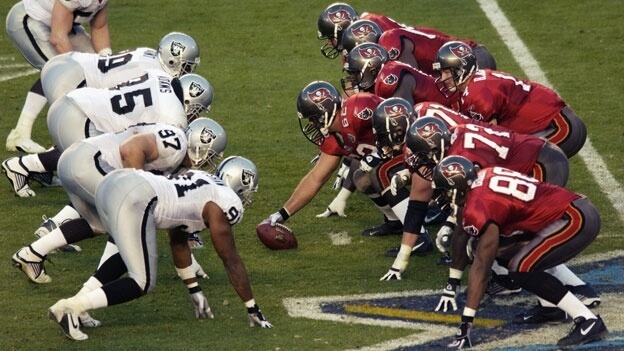 The Bucs went on to rout Gruden’s former team, the Oakland Raiders, by a score of 48-21 in Super Bowl XXXVII. Gruden’s familiarity with the Raiders’ players and playbook paid off, as John Lynch and other Bucs players recognized some of Oakland’s formations and plays at crucial points in the game. The Bucs became the first team to win the Super Bowl without any picks in the first two rounds of the previous spring’s NFL Draft, having traded these picks to the Oakland Raiders for the rights to acquire Gruden. Gruden became the youngest head coach to win a Super Bowl.